The joy in experimenting is an important prerequisite, but one should also master precise analysis as well as the documentation of facts. As the bachelor programme combines numerous aspects to a whole, it is a good preliminary stage to a consecutive master study programme. Aim of the master study programme chemistry is to acquaint students with an in-depth overview of chemistry's basic subjects. This is enhanced by electives in electrochemistry, catalysis, materials science, spectroscopy and biosciences. A completed master study programme in chemistry creates opportunities for a number of careers. The spectrum ranges from research, analytics, quality control to teaching, vocational training, management, journalisms or patent law. Chemistry is a central link between numerous disciplines like technology, pharmacy, materials science, power engineering, medicine, pharmacology, environmental protection or nanotechnology. Knowledge of chemistry - or to be more specific - molecular actions allows to face various challenges and to shape future oriented developments. 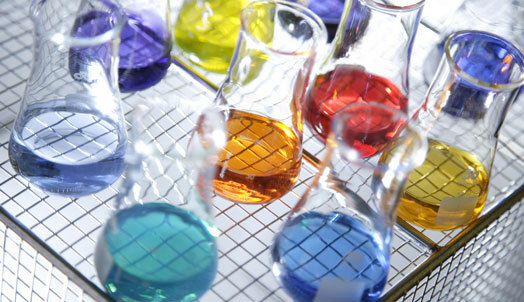 The study programmes in chemistry offers great prospects on exciting and versatile careers.